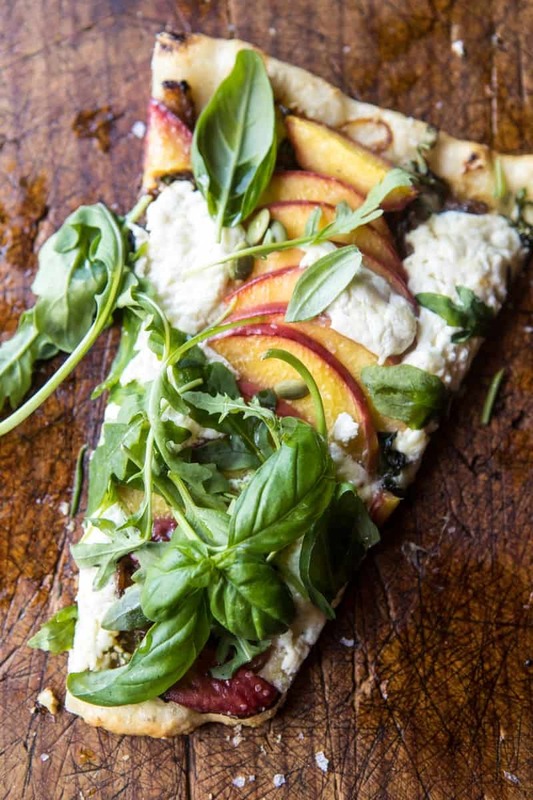 Oh Monday, what would you be without this Arugula Peach Ricotta Pizza?!? Ok ok, for real though, I feel like Mondays just require fun food, you know? I love salads, but let’s save those for our lunches, and let’s do pizza for dinner…sound good? Plus, this pizza is basically just like a salad with all that arugula on top…right, right. Got to love my reasoning right? To be honest, this pizza is happening today for a couple of reasons. Reason one would be all of the above. I do not discriminate against cheesy pizza no matter what day of the week it is, you guys all know this about me. Reason two, would be that unlike most weekends, this weekend was anything but relaxing. It was actually just a ball of stress and I am pretty happy it’s Monday. It started off great with a nice summer hike on Saturday morning. And then I did a really fun takeover of The Feed Feed’s Instagram stories where I made these hot fudge brownie ice cream sundae cupcakes (these are SO good, you just have to make this summer). That was all good and great, but then my mom called from Mexico with some news about my grandma who has been battling a rare cancer for over a year now. My aunt had just called her to say that my Nonnie is not doing very well right now, so my mom headed straight to Cleveland from Mexico yesterday. We all have our fingers crossed that the situation turns around and my Nonnie can gain some strength back, but it’s a scary thing to be going through. I’m trying to stay busy and positive. And, as if that was not enough, the Half Baked Harvest Facebook page was hacked Saturday night and someone was posting some pretty inappropriate content for about an hour. Luckily we got it under control fairly quickly, but that was zero fun. Again, fingers crossed that whole situation is now cleared up, but if you saw some weird content over the weekend, just know that it DEFINITELY was not intentional! Sunday was a beautiful day, and again, I tried to remain positive. The rest of the family returned home, which was so nice to have them back, especially my dad who really helps me out. I spent the day cooking, and all was OK. Or as OK as it can be right now, although I sure would appreciate a prayer or two for my grandma. Anyway! Sorry for the mile long start to today’s post. Just keeping you guys posted on life. Sometimes it can seem like things are so perfect for others, but life happens to everyone! OKOK. But onto happy things! We have pizza things to chat about today!!! Here’s the deal, you guys know how much I love pizza, and you know how much I’m loving all this great summer produce, so this pizza just had to happen. 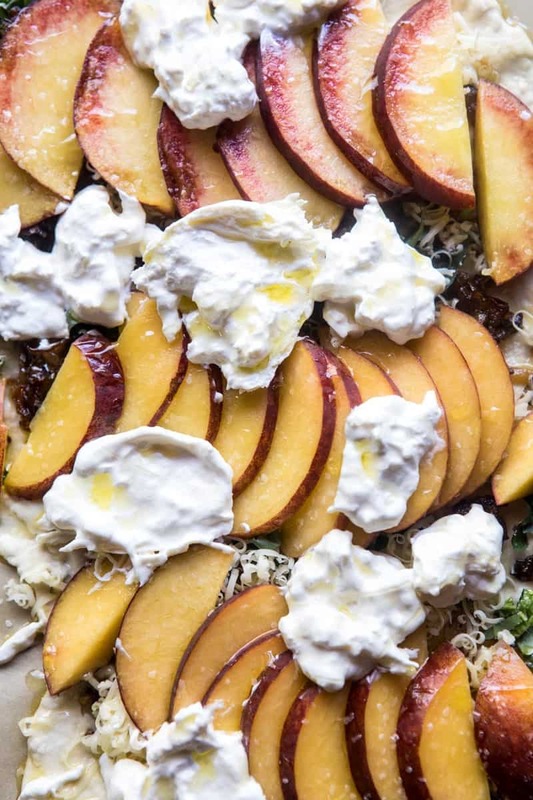 Peaches, cheese, and carbs has got to be one of my favorite summer combos. A lot of times I’ll pair peaches with fresh burrata cheese, but today I did something a little different and used a combo of sharp fontina and creamy ricotta. I love how their flavors and textures pair together…especially with caramelized onions and crispy bacon. I know, I know. You guys are probably wondering if I am pregnant or something with a pizza like this, but trust me, that’s most definitely not the case. Nope, I just love these bold flavor combos, honest…you guys will too! The onions get caramelized with a little honey to bring out their sweetness and the bacon gets added right to that same skillet to crisp. 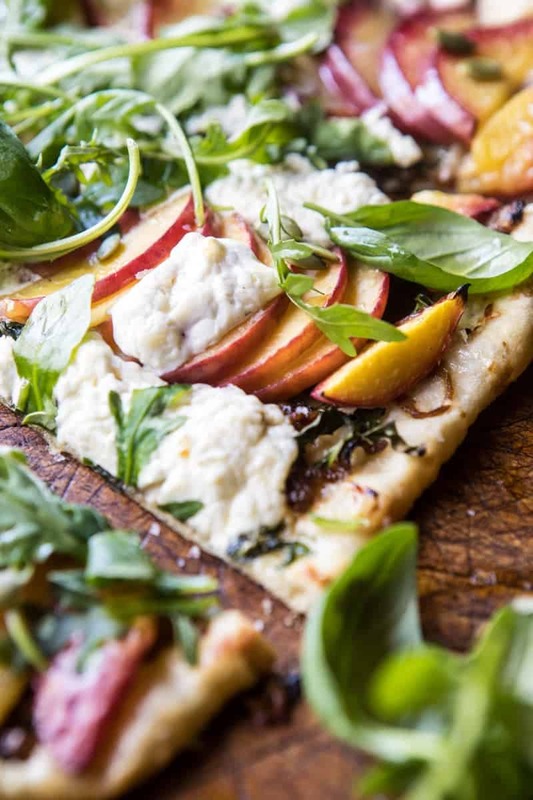 Finish off with a handful of fresh thyme and that right there is already the most delicious pizza…but of course it’s made better with the addition of two cheeses (hello to that fontina and ricotta), fresh peaches and an arugula on top. I love the savory, sweet flavors going on in this pizza. It’s perfect for lunch, dinner, or summer entertaining. And the best part…it’s super easy to make and you can use up all those summer peaches you have sitting in your kitchen. Which is actually another reason why this pizza happened in the first place. I was headed out of town and had one too many peaches, so I decided this pizza would be a great way to use them up. The only obvious solution, right? Yes, yes, yes. 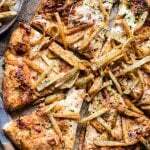 If you’re opposed to onions, and or bacon, you can certainly omit these from the recipe and your pizza will still be great. I personally love the additional flavor they add, but if you don’t like umm, you don’t like um! However, the arugula on top is a total must. 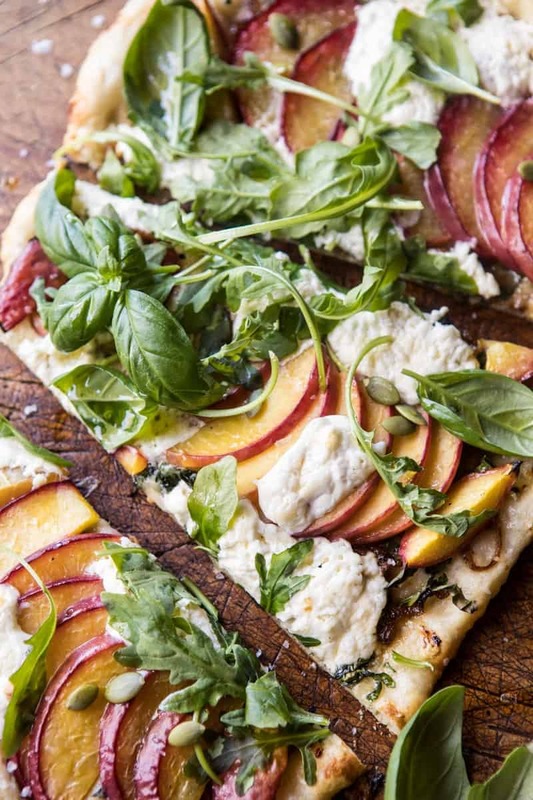 It’s spicy bite pairs so nicely with the sweet peaches, fresh ricotta, and balsamic vinegar. All together it’s just SO GOOD. 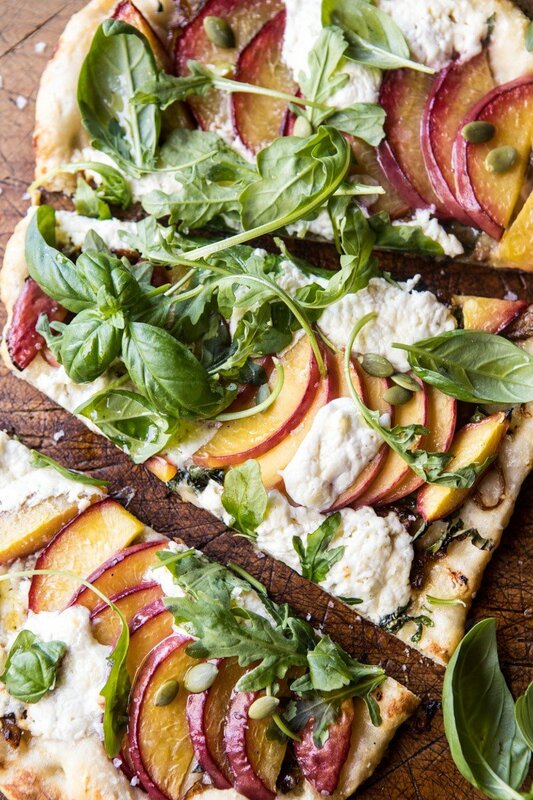 Going out on a limb here and calling this the ultimate summer pizza. Meaning you have to make this before the peaches are gone…are you ready? Set? GO! 2. Heat 1 tablespoon olive oil in a large skillet over medium-high heat. Add the onions, honey, and season with salt and pepper. Cook, stirring, occasionally until golden and caramelized. Add the bacon and cook until crisp, about 5 minutes. Stir in the thyme and cook another minute. Remove from the heat and drain off any excess grease from the bacon. 3. On a lightly floured surface, push/roll the dough out until it is pretty thin (about a 10-12 inch circle). Transfer the dough to the prepared baking sheet. Spread the dough with the onions and bacon and then top with fontina cheese, half the ricotta cheese, and fresh basil. Arrange the peaches over the cheese and season with salt and pepper. Dollop with the remaining ricotta. 4. Transfer to the oven and bake for 10-15 minutes or until the crust is golden and the cheese has melted. 5. Meanwhile, make the vinaigrette. Whisk together the remaining 1/4 cup olive oil, the balsamic vinegar, and a pinch each of salt, pepper, and crushed red pepper flakes. 6. Remove the pizza from the oven, top with fresh arugula and drizzle with the vinaigrette. 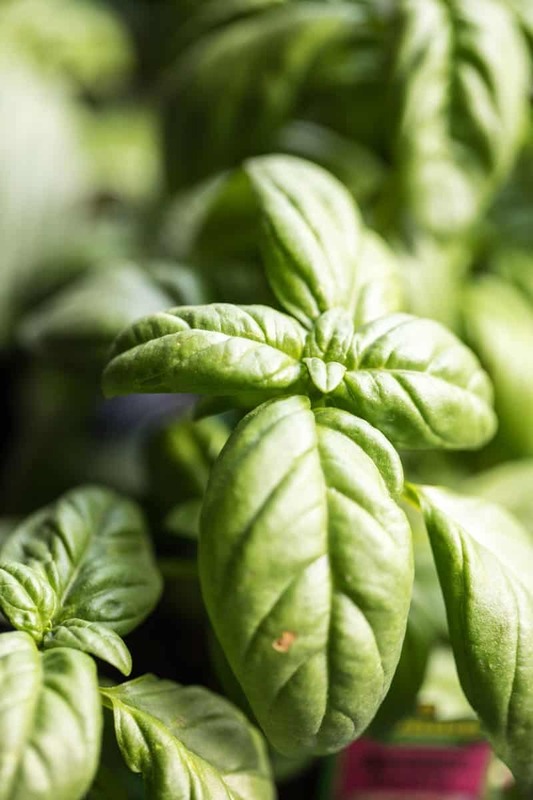 Garnish with basil and seeds. Slice and eat! PS. Pizza and Monday really do just go together…sometimes you just need cheese and carbs to fully embrace the week. <–truth. 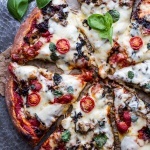 Thank you for sharing this fabulous pizza recipe. I’m sending you lots of positive vibes and good health wishes for your family – hang in there. Thank you Liz this really means a lot. I hope your family and loved ones are doing well! So sorry to hear about your Nonnie hun, sending prayers her way and hope she regains some strength soon. Hello, Tieghan, My prayers to your grandma and a lot of positive thoughts for her and her speedy recovery. 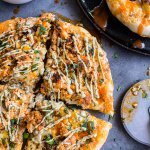 The combination of those ingredients in a pizza is fantastic! I love the combination of fresh arugula on top of the caramelized pizza. Enjoy! Thank you Carlos. This really means a lot to me. I hope you love this pizza as well. Thanks! Positive thoughts being sent for your grandmother and family, Tieghan. It’s especially tough when difficult things happen in the midst of such happy times. 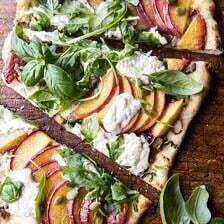 This kind of pizza is exactly what I love to eat in the summer. I make a similar one with nectarines and prosciutto. The combinations are so much fun to play around with. Keep cooking and hiking…those plus gardening are my biggest stress busters. I am really glad you are liking this recipe and I hope it turns out great for you! Many wishes of recovery for your grandmother! I hope everything turns out all right. As for your pizza, WOAH! I totally agree, Monday needs something like a pizza to liven it up. This one looks amazing – you got all the perfect flavor combos! I’m normally dairy-free, but I’ll have to make an exception for this pizza. Do you think I could grill it? This is amazing. I have ricotta in the fridge right now that is going to turn into this! I am loving all your videos and my three year old’s mind might explode when I make him the ice cream sundae brownie dipped cone recipe! YUM! Can’t wait for your cookbook! Ah so excited for you to try this one Amy! Thank you so much!! The videos have been so fun to make. I hope he LOVES them!! Sending lots of good thoughts to your grandma and you. Please know blessings are going way out to your Grandma and family. Thankfully your Mom is able to be with her; how comforting. So very sorry you are having to deal with this kind of stress. Hearts, peace and love to you all. You have a tight community here that so care about you Tieghan. You are a very special gal. ..And you make wonderful pizza’s 🙂 And we are abundantly grateful for all that you do. Awh thanks so much Tammy! I couldn’t be happier my mom is able to be there with her! We are all keeping positive! Sending our prayers your way Tieghan! 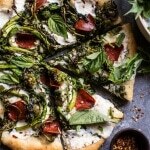 I’ve done a very similar pizza before with burrata so I know just how amazing the flavors are in this! Summer pizza perfection! Ah yes!! Its so so good!! Love summery pizza! I love the flavor combo you have going on here and the whole milk ricotta cheese!!! YUMMM! so beautiful! Mondays would be nothing without this pizza Tieghan! Such a delicious summer pizza. I can never get enough peaches during the summer. I will keep your grandmother and family in my prayers. NEVER can get enough peaches in the summer is right!! Hope you love it! 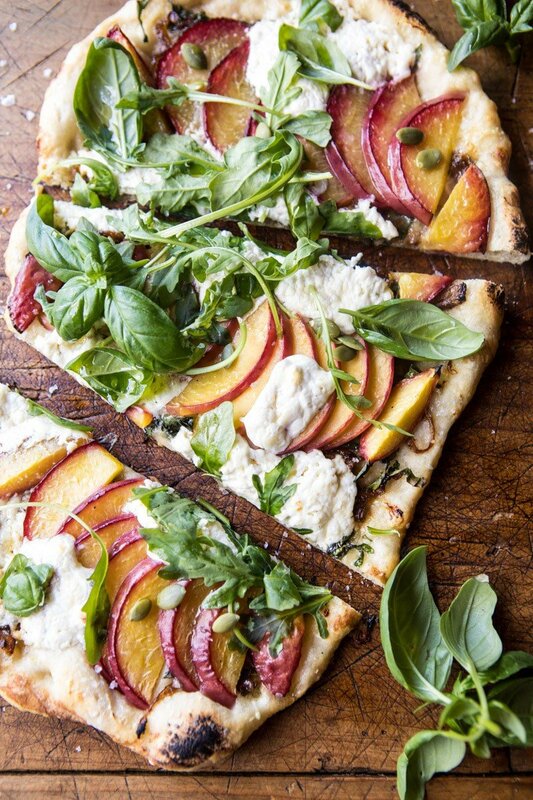 Literally obsessed with peaches on my pizza. YUM! Yes!! ME too they make it so so good!! Thank you so much it means a lot Laura! Hope you love the pizza! I hope it works next time!! So happy your trying!! So happy you tried it Sandy!! The substitutions sound amazing! Thank you for making it!! This was super yummy! I used nectarines due to an unfortunate peach allergy, but the cheesy carb-y goodness was heavenly. I love the fresh produce… it makes anything indulgent feel healthy! I am so so glad you loved this Libby!! Thanks so much!